A Lesson From Uncle Rico (Let It Go) – Stew Rd. In 2004, the movie Napoleon Dynamite was released and became an instant cult classic. The movie is a collection of awkward moments that chronicle how the main character, Napoleon, through no easy process, eventually wins the appreciation of his peers. 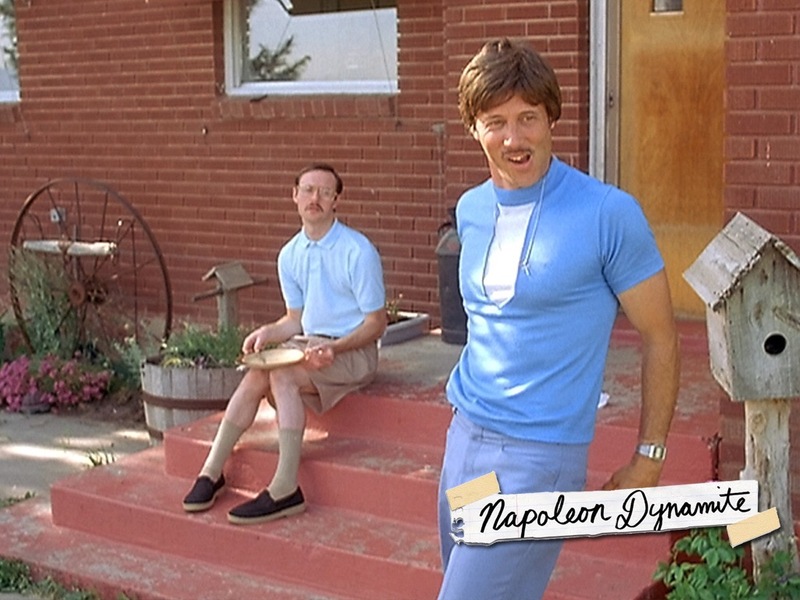 Napoleon and his older brother, Kip, eventually end up in the care of their Uncle Rico after a four wheeler accident puts their grandmother in the hospital. Uncle Rico is a guy that is completely stuck in the past and daydreams about ways his life could have been different so things would have turned out better in the present. People tend to love or hate the movie and it is the kind of movie that is exponentially more fun to watch with friends that enjoy it and quote the punchlines right before they happen. One of my (many) favorite parts of the movie is this dialogue between Uncle Rico and Kip. Uncle Rico: Back in ’82, I used to be able to throw a pigskin a quarter mile. Uncle Rico: I’m dead serious. How much you wanna bet I can throw a football over them mountains?… Yeah… if Coach woulda put me in fourth quarter, we would’ve been state champions. No doubt. No doubt in my mind. Uncle Rico: Kip, I reckon… you know a lot about… cyberspace? You ever come across anything… like time travel? Kip: Easy, I’ve already looked into it for myself. Uncle Rico: Right on… right on. The humor is that he is terrible at throwing a football and it is clear that he would not have “won the game” so to speak. I appreciate Rico for a few reasons. Jon Gries, who plays Rico in the movie, does a great job of portraying someone that has so much nostalgia and hope in the past that they can’t really move forward today. Ouch. … That moment was telling. At the time I didn’t realize how broke my “hoper” was. I was in my early 30’s talking about the glory days as if I was already an old man that couldn’t see a hope and a future. I guess the bright side is that I had seen some amazing seasons that greatly impacted me and many others. The down side was that I didn’t have enough hope in the here and now to inspire those around me at the moment. It is true that if you are not excited about the here and now, you have little to no chance of inspiring those around you and if you are not excited about the possibilities in the here and now you may want to find out what is broken. If you are going to grow as a person and continue to become the person Father made you to be (infinitely awesome:), then you will have to let go. Psychologists talk about “emotional age.” Many times a traumatic or painful life event will cause a hang up in the soul of a person that will keep them from maturing emotionally or mentally in some part of their life. Have you ever seen the show ‘Hoarders’? Almost without fail, every case of extreme hoarding is because of an inability to let go. It may have been the loss of a loved one or a relationship that was dear to them or some other kind of painful life experience. Sometimes people don’t get stuck in the past, they get stuck in the future. They are always looking to what might be, looking and hoping for a dream to materialize or just for things to change for the better. Maybe it wasn’t something painful you need to let go of. Maybe it was something really great. No matter whether it is something positive or negative, finding yourself stuck in the past or the future is usually a sign that you have lost hope for the here and now. The God of hope! There are many definitions of hope but I like to define it is as the expectation of God’s goodness toward me in my future. Joy is the awareness and celebration of God’s goodness towards me in the here and now. According to Romans 15, we have hope when we trust Him. The byproducts of trusting God and his heart toward us is joy and peace in the present. His spirit gives us the strength and ability to see the future through the lens of His purpose and plans which are good no matter what the weather in your life is like right now. So, what is it today that you are not trusting God with? Do you need to forgive someone? Let God into a place of pain you have closed off? Allow Him to give you hope for a difficult situation you are facing today? Sure there are some things out of your control at this moment. Talk to the Father about it. If he can keep the universe from falling apart, I am pretty sure He can navigate you to the other side if you let Him. And if you are really stuck today, find someone who has joy and hope. Better yet, find someone who has been through a struggle or two and still has joy and hope and talk to them. They might be able to point you in the right direction. So, here’s to letting go and Uncle Rico and the rest of us today – let’s grow. Bob, I’m really enjoying your blog. Thank you, Sharon, I appreciate that! It is neat to connect with you here – hope you and your family are doing well. SO good!!! Thanks for sharing!! another home run. This stuff just flows out of your being. You are an inspiration. Seriously, thank you though. Hoping my story can save some folks some time – advance a few paces quicker than I have. Good article Bob. The anointing is flowing through you. Saw it in person last time I was there, and seeing it now. Keep growing and keep flowing. Thank you, Duane – I appreciate that. You are a blessing. Pingback: Gotta Let Go To Grow – Stew Rd. Pingback: Overcoming Regret pt. 2: Celebrate What “Is” Instead of “What’s Not” – Stew Rd.